I make naan not very often, and whenever I do it's difficult to take pictures as everyone of course likes to eat hot naan. I took these pictures along with paneer makhani, which I posted which I have already posted last year so you can guess this pictures has been with me for a long time now, I did took some naan pictures recently but I was not happy with the outcome so thought it's share what I have in my treasure for now. 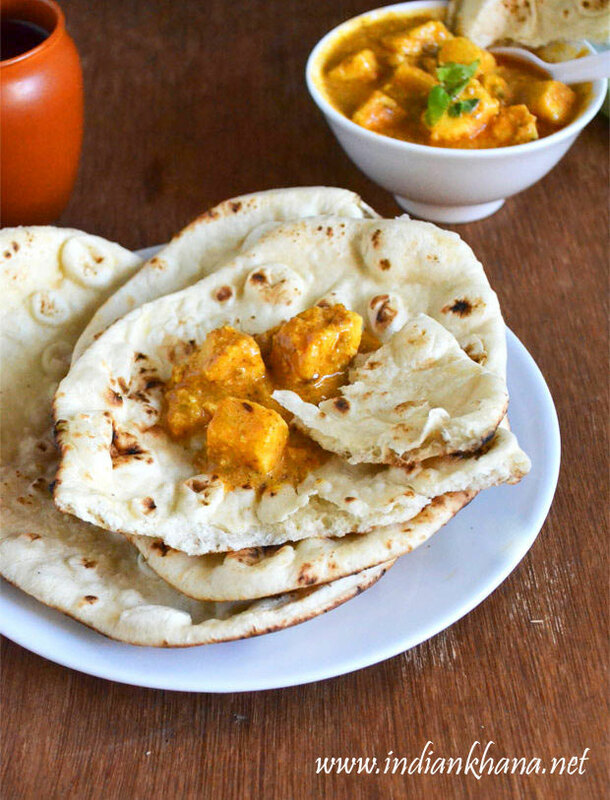 These naan stays soft for a long time even if it's cold so do try it but always don't roll naan very thin like roti otherwise it will become hard and chewy.. If you wish you can use half of maida and half of wheat flour but the texture and taste will be different for sure in that case. I had lot of request to post naan recipe and here I am finally able to do it and yes I will work on the remaining request too :). 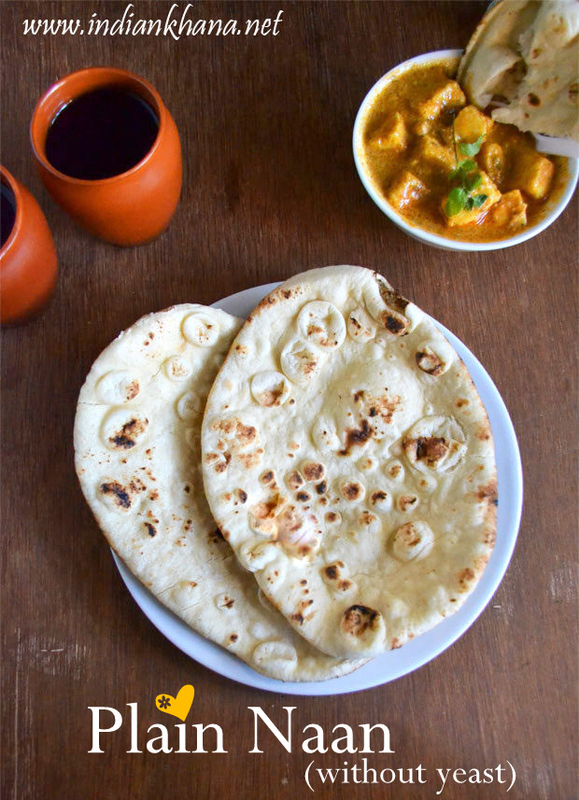 You can serve this naan with paneer butter masala, paneer makhani, veg korma, kofta curry, chicken curry, kashmiri chicken, mutton curry, egg curry, mix veg dal or anything that you like :), do try this easy naan at home and share with me how you liked. Start adding milk in small quantity to make smooth dough, over the dough with damp cloth and keep aside for 2 to 3 hours or you can keep 6-8 hours or even over night (more you let the dough rest softer naan will be). Divide in to 6 or 7 portion, make smooth ball and flatten them. Take one piece of dough, dust well with maida and roll into oval shape, you can also make in triangle or round shape. Apply water on top of naan. Meanwhile heat a tawa, place naan on tawa with water brushed side facing tawa so it's gets stick to tawa. 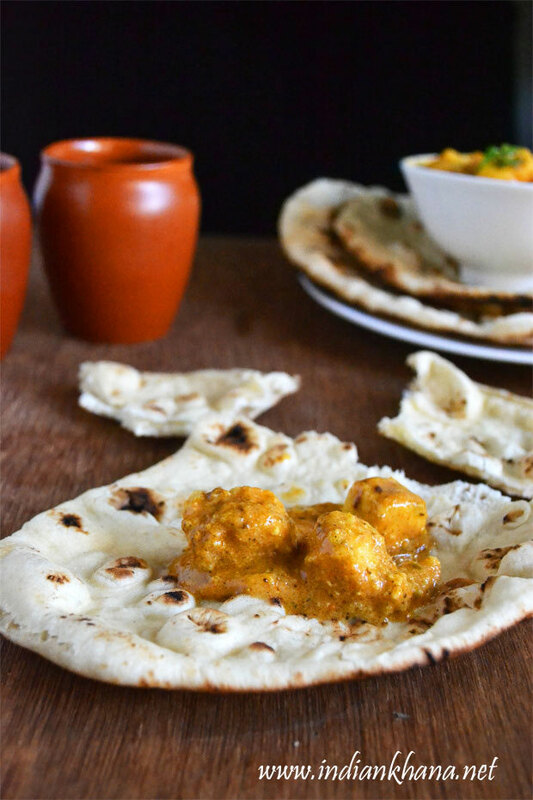 Cover tawa and cook for a minute in medium flame or until bubbles appear on naan, Use a tong and roast naan directly on flame (keep flame in medium to slow) for 10 to 15 seconds each side, also roast naan edges so it's gets cooked. Or you can turn the tawa upside down and let naan let's cooked. Apply ghee or butter on hot naan and repeat same for rest. 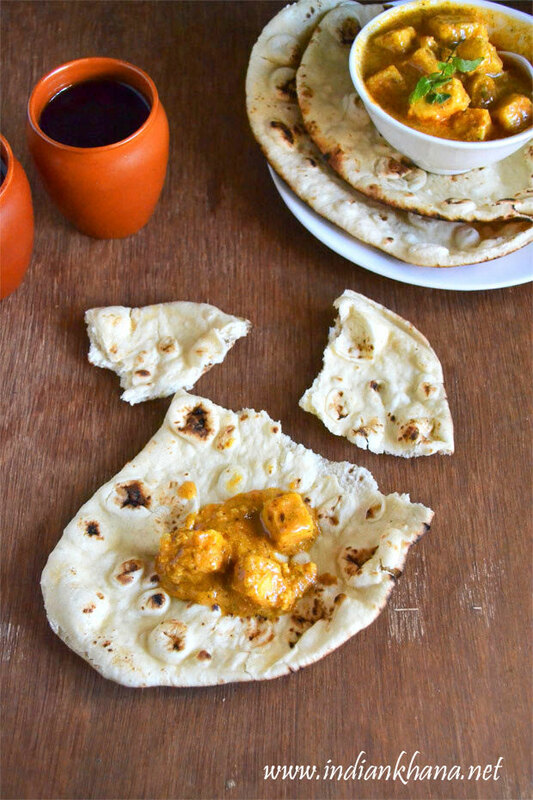 Serve hot with paneer butter masala, paneer makhni, kofta or any side dish of your choice. 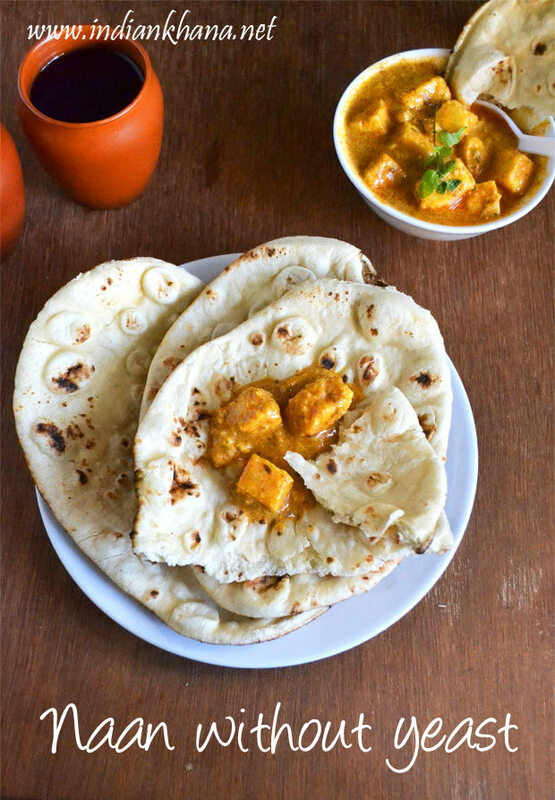 If you have time prepare the dough and keep aside for over night in refrigerator or you can also keep it in 24 hours in refrigerator, naan will be very soft. The longer we keep the dough the better it is. If you fermenting the dough more than 6 hours keep it in refrigerator. 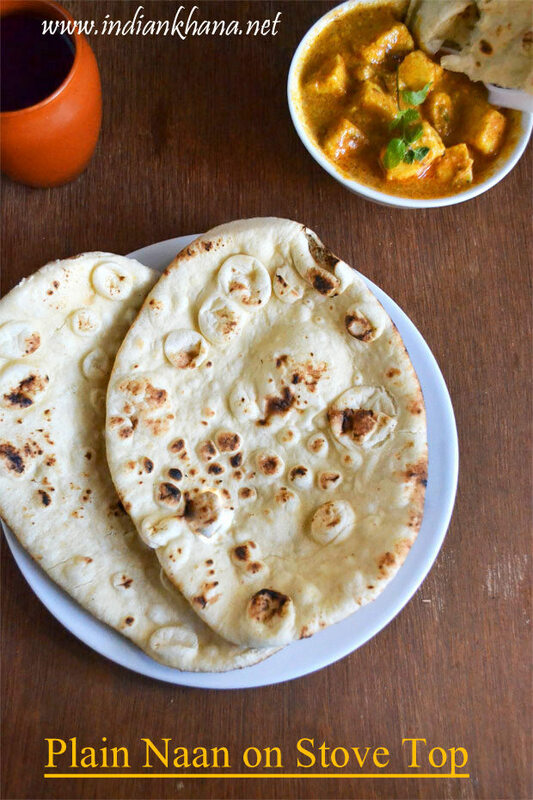 Delicious and soft naan at home.